(Published June 14, 2016) - My visit last week to Helsinki, Finland was truly amazing. Ari Korhonen a well-known angel investor in Finland organized my ecosystem trip with the support of his wife Florence Korhonen. Ari Co-Founded the Finnish Business Angels Network (FiBAN) and is Vice-President of the European Business Angel Network (EBAN). Ari was kind enough to organize my visits to the FiBAN, to Microsoft Flux Summer of Startups Program, to Startup Sauna and Florence organized a meeting with NewCo Helsinki Accelerator. I was very well impressed with the strength of the ecosystem, with the openness and hospitality of the tech investment leadership and the quality and global mindset of the accelerator programs. I also had the unique opportunity to coach four teams at the Microsoft Flux Summer of Startups Program and was very impressed with the quality of the teams and the business ideas they are pursuing. I hope we will continue our conversation and soon have a couple of Finnish Startups participate in Parallel 18 (P18) Puerto Rico's leading tech accelerator. In fact, one of the Finnish teams already applied to P18 after learning about it during my visit! I also hope that some Finnish startups visit and use some of our co working spaces such as Piloto 151. I believe that the quality of the Startup Sauna Accelerator program in Helsinki could be a real asset for those technology companies based in Puerto Rico looking to expand into the European market. According to Startup Sauna Accelerator Chief Operating Officer, Kasper Suomalainen, it is easier to get into Harvard than to the Startup Sauna! Finland is a country that in many ways resembles Puerto Rico - it is a small country of 5 million people formerly dominated by the Swedish Russian Empire for about 559 years and by the Russian Empire for about 108 yrs. Incredibly enough, Puerto Rico was under Spanish Rule for 405 years and now under the US for about 118 years. Who knows what history has in store for Puerto Rico but definitely Finland was able to move on from their past and build one of the most incredible countries in the world with top grades in all aspects including education and economy being ranked in the World Economic Forum Competitiveness Report #8 in the world. That's pretty good for a small country. More recently, Finland has had to deal with the loss of Nokia's leadership in the mobile market. Nonetheless, with their effort and creativity the Finns have turned their economy into a technology hub in the Nordic region. Developing a strong technology entrepreneurship ecosystem is one of our key goals in Puerto Rico and together with the rest of our ecosystem partners I am confident we will. If Finland survived the collapse of Nokia, we can also survive the Puerto Rico debt crisis and actually be at a much stronger position in the near future. One would think that investing in technology is something easy, or hard, depending on who you ask. From our perspective, having already advised technology companies for more than a year, and having been a part of at least two technology start-ups, we can say that we absolutely love it! Now, the question we are asking ourselves is, with the current revolution on the cloud where costs have gone down so dramatically on being able to start a technology company, what will the future look like? We would like to ask our audience, what they think. Is mobile the future? Will PCs be eliminated? How can we keep up with this revolution and be part of it? At REOF Capital LLC we want to be a part of this revolution. This is why we decided a year ago that we would shift our focus from real estate, distressed investment and fixed income research and move into the technology space. Leadership is all about rallying people around a purpose. So in our case, we have had to rally our amazing team at REOF Capital LLC and our past, present and future clients into only one direction: technology. This also means that our small investment practice now needs to reposition itself from real estate and into technology. How have we done this? Well, simple. We decided that the best way to get to know an industry is to work as much as you can in that industry, but with an absolute and relentless focus on perfection and hard work. It also means that we must become ourselves, almost, a technology company in our way of being and our way of life, so that our customers and future portfolio companies feel and see that we understand them completely and that we are, indeed, one of them. We are convinced, deep down in our entrepreneurial hearts, that this is the right direction for us. We are not entirely sure, what the future holds for us, but we know that we are moving in the right direction. That is why, recently, we embarked on the creation of a new investment vehicle so that we can - together with other colleagues from the local investment community, technology start-ups and mid-market companies- build a more robust technology investing ecosystem at the regional level and support linkages with other countries such as Mexico, Colombia, Panama, Costa Rica, Dominican Republic and other US States in our region. We even argue that from the get go it is critical to have global linkages to other regions, including Europe, Israel, India, China and the Middle East! We are loving it! At REOF Capital LLC, we hope that if you are interested in joining this regional tech investing ecosystem revolution you join us in this quest. If you have any comments or questions regarding this post, feel free to contact asosa@reofcapital.com. REOF Capital's Antonio Sosa speaks at the MENA Angel Investors Summit 2014 in Bahrain. His keynote can be seen at the 1:19:37 mark. After the Puerto Rico legislature approved a law that allows public corporations to restructure their debt, the municipal bond market prepared for the possibility of its biggest ever default. The Bond Buyer writes about this topic. Read the article here. As we deal with our current crisis, we can easily forget that crises such as ours have happened before and will probably happen again in other societies. When looking for analogous situations to the credit crisis of Puerto Rico we only have to go back three short years to Ireland, a country similar to Puerto Rico in many ways. Analyzing the debt ratings of Ireland compared to the prevailing ones for Puerto Rico, we can see that on July 11, 2011 Ireland’s debt was rated at BA3 (two notches above investment grade). On the next day, July 12, 2011, Moody’s downgraded the debt to BA1 (one notch below non-investment grade). On that day, and for some months after that, the yield on the bonds reached 14.07%. After spending the next two and a half years sorting the fiscal mess they had on their hands, Ireland went back to the Bond Market on January 7, 2014 to borrow $5B USD (3.75 Euro). The demand for the issue was incredible, receiving in bids $19B (14B euro); over four times the issue amount. The yield paid on this offering was only 3.54% (as of March 3, 2014 the yield had gone even lower to 3.33%). On January 14, 2014 Moody’s upgraded the bonds to BAA3, bringing Ireland one notch over investment grade, less than three years from the bottom. Click here to read the full article, Puerto Rico: Harbour of debt. Congratulations to Antonio Sosa as he was featured by Caribbean Business PR's 40 under 40 list. You can click here to see the feature. REOF Capital's Antonio Sosa was recently interviewed by Bloomberg. Click here to read the interview. 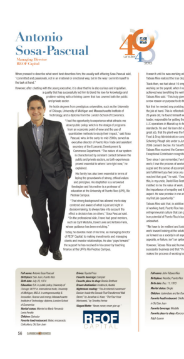 Recently, REOF Capital and Antonio Sosa have been featured in America's Quarterly. You can click here to read the article online. You can also download the Author Packet PDF. Also, REOF Capital and Antonio Sosa have been featured on Noticel. Click here to read the article online.